Koyomi and Meme finally succeed at fully restoring Kiss-shot. Koyomi expects Kiss-Shot to then change him back to human. 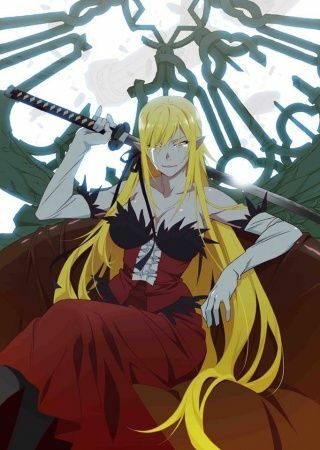 But before that, Kiss-shot and Koyomi spend an evening on a rooftop, where Kiss-shot reminisces about her previous minion, a Samurai who chose to commit suicide when Kiss-shot was not able to restore his humanity. Koyomi goes off to buy food, but when he returns he finds Kiss-shot eating the eviscerated corpse of Guillotine Cutter. He is horrified at the realization that Kiss-Shot will now hunt humans again, and that he himself will want to hunt as well. Read more on Wikipedia.